Much like the October Detached Market Report, the condo/townhouse market was very similar to September. A cool down, but not much change on a month to month basis. Although this may come as a surprise to some, I think it’s important to understand markets don’t change overnight. We just experienced the hottest real estate market in history. This fire will need more than a couple buckets of water to put it out. Condo sales dropped in every area this month except for Richmond which saw a small increase. In fact, condo sales are actually well below normal levels when comparing over the last 10 years (2005-2015). For example Vancouver West sales were 22% below average. While REBGV returned to normal levels. Here’s where things get interesting. New listings for October are down from September. In fact, they are well below normal levels. So despite sales dropping you are seeing little change in price because there are so few listings coming on. As I have mentioned before, people are more reluctant to sell when recent price appreciation has occurred because of a belief the investment will go up further. 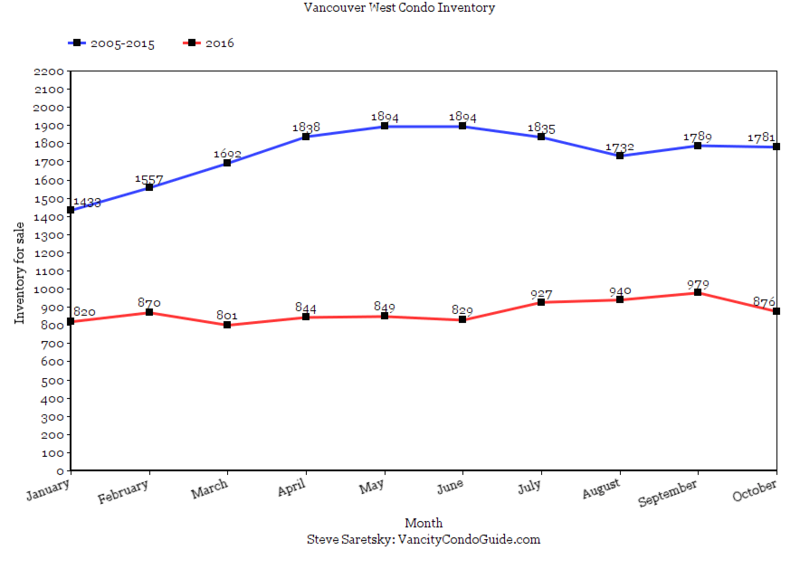 For example, Vancouver west condo inventory for October was 51% below the 10 year average. Until more people start selling it will be hard to see prices move much. Below is a graph that shows the average inventory levels by month over the past 10 years in comparison to 2016 levels. I have condo sales/actives ratio dropping for all areas this month except for Richmond and REBGV. As I mentioned previously, despite a drop in sales this month, new listings remain scarce thus keeping an upward pressure on the sales/actives ratio. As you will notice, it remains a sellers market with inventory levels remaining incredibly low, but overall quite similar to what we saw in September. Condo prices remain relatively the same. As I continue to harp it’s irresponsible to look at price fluctuations on a month to month basis. Condo prices remain relatively firm and have definitely stabilized despite it remaining a sellers market. The median price of a Vancouver west condo is down 4% from it’s peak in June. 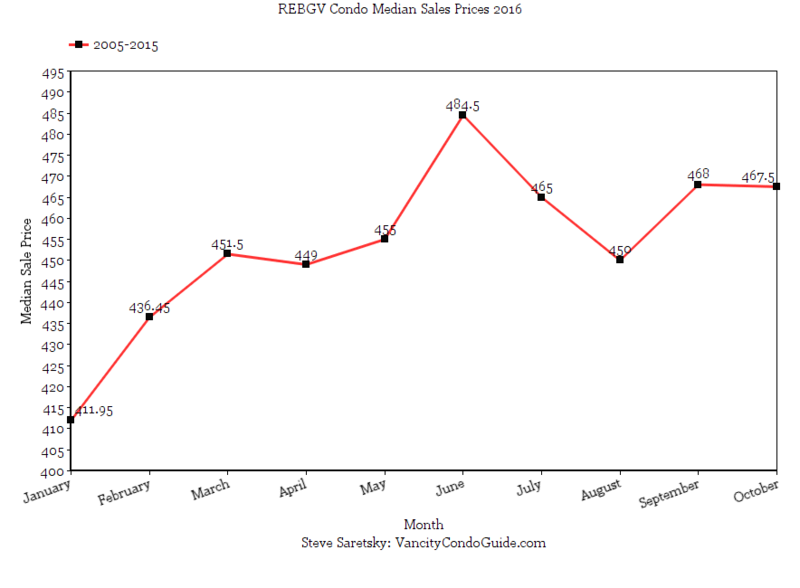 While the median price of a condo for REBGV for October was $467,500. As I mentioned in a previous post (You Can Afford that Whalley Townhouse) based on the average income in Vancouver being $80,000, according to CMHC’s qualifications of “affordable housing” the average buyer should not be spending more than $400,000. October townhouse sales were very slow, except for Burnaby. 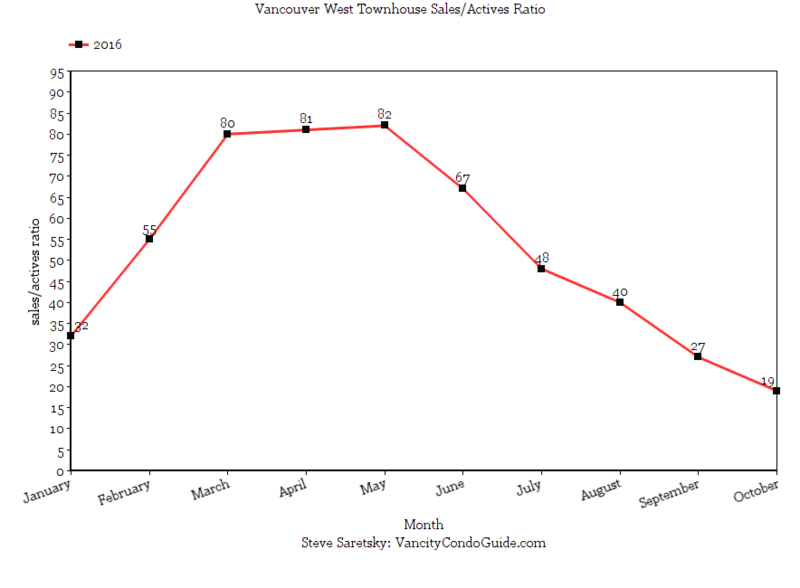 In fact, Vancouver West had the fewest townhouse sales since the 18 sold in October 2008. REBGV townhouse sales were 14% below the 10 year average. New listings and overall inventory remain scarce for townhouses. REBGV new listings were 9% below the 10 year average, while overall inventory was 49% below the 10 year average. Sales to actives ratio fell everywhere except for Burnaby and REBGV. However, Vancouver West townhouses fell out of a sellers market for the first time since November, 2014. Despite inventory levels being 47% below the 10 year average, sales plummeted to their lowest levels 2008. It’s been a remarkable turnaround for Vancouver West townhouses. Going from a very hot sellers market peaking at an 82% sales to actives ratio in May to just 19% in October. A bit of a mixed bag here. Vancouver West now in a balanced market, while the other areas remain in sellers markets. Other than Burnaby there is very little change from one month ago. Townhouse prices are clearly on the way down. Despite many areas still technically in a sellers market there are very few sales and less desirable townhouses are having a more difficult time selling. 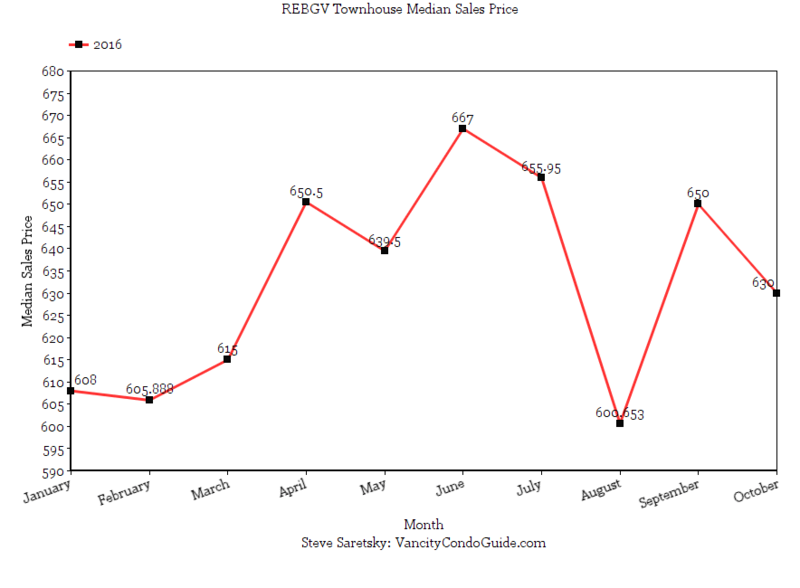 The median sales price for REBGV townhouses in October was $630,000. This is down 5.5% from it’s peak price in June. The condo/townhouse market for the most part continued it’s cool down in October. There were fewer sales despite record low inventory levels. Although sales/actives ratios indicate it’s still a sellers market, prices have now levelled off and appear to be trending downwards. However, because their was a decrease in new listings and inventory levels remain low, it will take a continued decrease in demand or a surge of new inventory to really push prices down. It’s fair to say the sellers still have the upper hand here. It is also important to recognize the condo/townhouse market lagged roughly 4-6 months behind the detached market when prices took off and I expect the same with a correction. The detached market has only been in a buyers market for 3 months now. Anyone expecting an overnight change in the market dynamics is sorely mistaken. I expect little activity over the winter months as both buyers and sellers wait to see what the New Year brings. However, a glut of new inventory could be on the way in 2017 as new projects complete thanks to record housing starts in 2016. Like this post? Get my best work sent your inbox here.